It’s been a while since I finished second in my age group and 13th overall in a race. 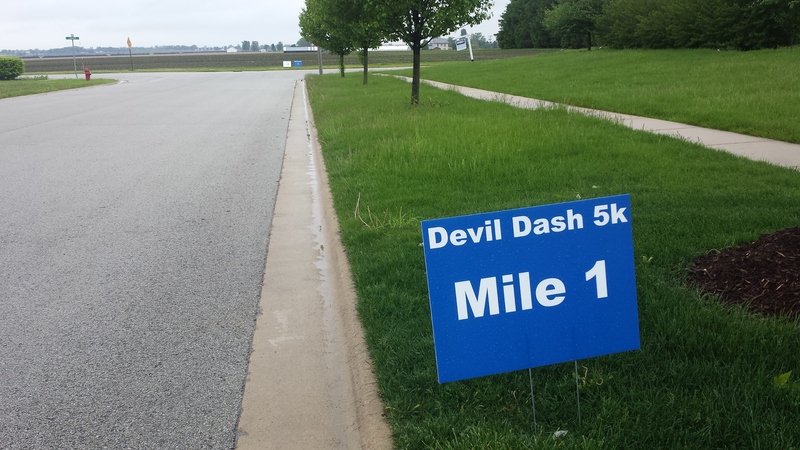 Admittedly, I had a bit of a hometown advantage in the Peotone Devil Dash 5K since the start line of the race was only about five minutes away from my house and most of the course was on roads that I run on almost every day. I usually travel for my races, so being able to do one that was this convenient was a nice change. If you don’t live in the south suburbs of Chicago, you may not have ever heard of Peotone. If you drive south on I-57 through Will County, the Peotone exit is the last one you’ll pass before entering Kankakee County. This makes its location the furthest south a town can be and still technically be called a Chicago Suburb. If you live in downtown Chicago or in the North or West Suburbs, Peotone might sound vaguely familiar since it’s mainly known for being the potential site of a third Chicago airport if one ever gets built. Otherwise, it’s a small mostly rural town with a population of about 3000 that’s about 40 minutes south of downtown Chicago. My family and I moved to Peotone from Park Forest a few years ago so our daughter Sara could get a good education. Living there has been kind of a balancing act since I work downtown, but I’ve come to enjoy running on back country roads while also being able to drive downtown in less than an hour if I want to run in the city instead. 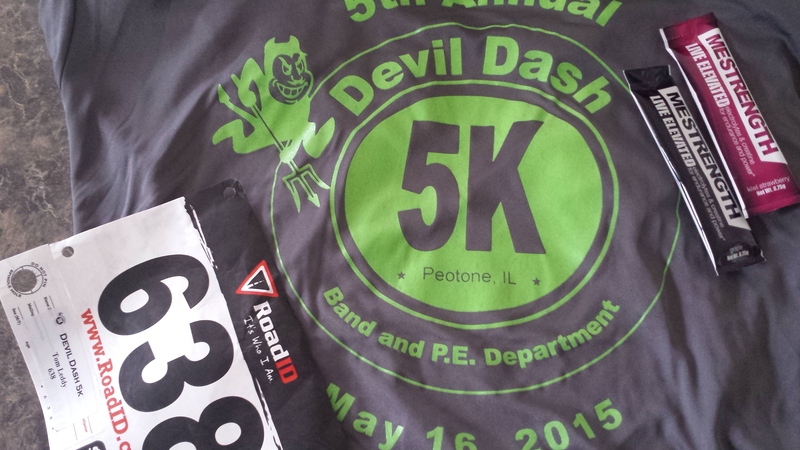 The Peotone Devil Dash is a joint fundraiser for the Peotone School District Band and P.E. Departments. The race is named after the Peotone High School sports team’s nickname, which is the Blue Devils. My daughter Sara just started playing the flute, so being able to raise money for the band is important to me. In 2015, the Devil Dash celebrated its fifth year and as far as the course is concerned, I think that this is finally the year that the race organizers got things right. I did the inaugural race in 2010 and while the course was called a “5K”, it was really only about 2.7 miles long. The race organizers made some adjustments the following year but ended up making the course too long (almost 3 1/2 miles). There have been a few more adjustments since then and in 2015, the race organizers were able to find a good route through the town that was exactly 3.1 miles long. They also got the course certified by the USATF. Packet pickup for the Devil Dash starts at 7:30am on race morning. The race itself starts at 8:00. This doesn’t seem like very long, but with the number of runners who do this race, a half hour is more than enough time for everyone to get their packets. I didn’t get there until five minutes before the start of the race and still had no problem getting to the start line in time after picking mine up. The packets come with a technical running shirt and some standard 5K goody bag type stuff (coupons for local businesses, chap-stick, a plastic cup with the race name on it, etc…). The 5K course starts and ends at Peotone High School. At the start line, some Peotone High School Band Members play the National Anthem and then runners are off. 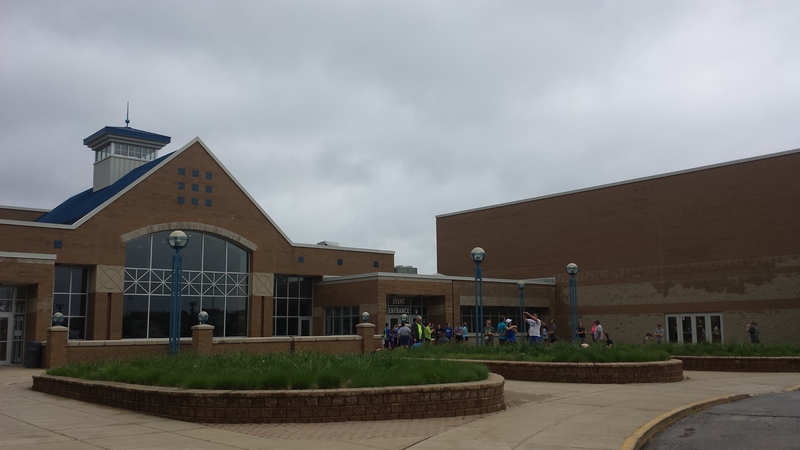 The course passes by Peotone Junior High, Peotone Elementary School, and the Connor Shaw Building, which is a school district administration center and also houses the Peotone Preschool. Since proceeds go to programs in the school district, race organizers made sure that runners would pass as many schools as possible during the race. The course also goes through some residential areas and through part of the historic downtown Peotone area. There are a few spots along the course where people gather to cheer for the runners and there’s a water table at roughly the halfway point. Of all the different course iterations I’ve seen for this race, this one was definitely the best. There’s also a one mile walk available for people who want to support the school programs but don’t want to do the 5K. That course follows the same route as the 5K course for about the first half mile before turning back and doing a smaller loop back towards the high school. After the race, there are snacks and bottled water for runners back at the high school and an awards ceremony that starts at 9:00. 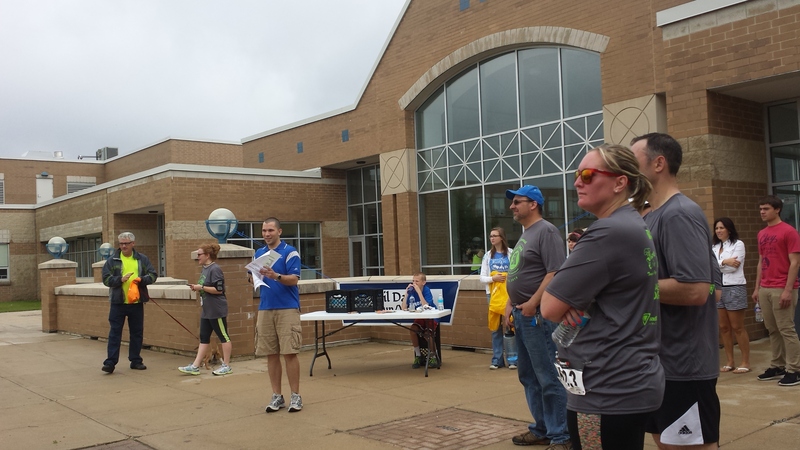 Medals are handed out to the top male and top female 5K finisher from each age group. The nice thing about the race being local is that some of the winners were friends and neighbors of mine. Now that all of the improvements have been made to the course, one thing that I’d like to see for next year’s Devil Dash is more advertising. About an hour before the start of this year’s race, there were some pretty severe thunderstorms that rolled through Peotone, and I have a feeling that there were some people who registered for the race that ended up staying home (their loss since the rain let up by the start of the race and then held off for the rest of the morning). But even with that, I would have liked to have seen a bigger turnout. I didn’t know when this year’s race was until Sara happened to mention it a few days before race day. In 2014 I missed the race completely because I never saw it advertised anywhere. I only knew that there was a race that year because I happened to go for a run on race morning and I saw a bunch of other people running with race numbers on. I wouldn’t mind seeing an email sign-up list on the race website so that I can get reminders about future events or a flyer sent home with all the students at the Peotone Schools advertising the race. The more participants the race can attract, the more money will be raised, so better advertising works well for everyone. Overall though, the Peotone Devil Dash was a lot of fun and the course has improved a lot over the last few years. I like the direction that the race is going in and with a little bit more advertising it definitely has the potential to become a really nice local race in the south suburbs. I’ll be looking forward to seeing what 2016 brings. I enjoyed reading your review! I also ran this year for the first time. It does happen that I have been in the area for the past couple of years. This year, I checked on a site of races by state, and date, and found this one. It fit perfectly into my travel plans. I thought it was well organized, the course was safe, as the major intersections were police patrolled, and everyone was very friendly. I would definitely recommend this race to others as well. The weather held off perfectly. Luckily!!! Thanks for the comment. I’m glad you liked the review. Do you have any other races coming up in the area?